Swansea City have confirmed "certain players" were involved in a training ground bust-up but say the squad are fully united in focusing on Premier League survival. The incident happened before the 1-0 defeat by Chelsea on Sunday. "Yes, there were a couple of incidents between certain players, which the club does not condone yet understands," confirmed a Swansea spokesman. "They were quickly dealt with and everyone moved on." 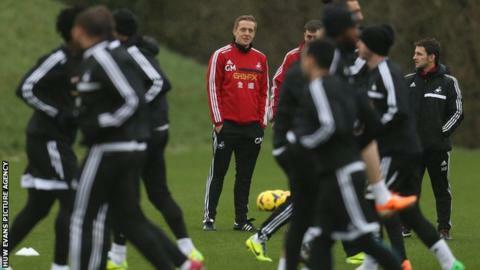 It is not the first time Swansea have had problems at training. In January defenders Chico Flores and Garry Monk, before the latter took over from Michael Laudrup as caretaker manager, were involved in a flare-up at the training ground. The Swans confirmed the police were called out to that incident after a member of the public phoned them. Since then the Welsh side have been drawn into a relegation fight and are currently 15th in the Premier League, three points off the relegation places with four games remaining. Swansea have only won two of the 13 matches Monk has overseen as head coach since taking over from Laudrup in February. "These things often happen on training grounds up and down the country, so despite the media reports, Swans fans shouldn't be concerned," added the spokesman. "The squad had just returned to training on the back of a disappointing defeat at Hull and their frustration at not getting the result they wanted boiled over during a full 11 v 11 practice match between the group. "There are a lot of winners within the squad and they want to finish the job. You only have to look at the commitment and effort they put in against Chelsea on Sunday with just 10 men to see that. "It certainly looked like a team that was fighting for each other rather than against each other - as is being suggested in some quarters."